When buying a home make sure that the purchase and sale is contingent upon having a house inspection, with a house inspector of your choice, and that the report findings meet your approval. The inspection of a house, prior to buying it, is critical as it can identify major problems that you may not otherwise see. Many of the problems identified in a house inspection are fairly minor and you can elect to ignore them or you can ask the seller to fix them prior to the closing. In some cases, however, the house inspector may uncover large problems. The problems may be so big, such as structural problems with the home, that you may want to walk away from the deal. By including language in the purchase and sales agreement that allows you to do this, you can protect yourself from losing a deposit or being forced to go through with the closing. Also keep in mind that most banks require the inspection of a house prior to providing a mortgage. Often they will stipulate in the loan application that a house inspection is required and that they will need to review and approve the results prior to giving loan approval. When scheduling the inspection of a house, the options available to you are similar to ordering from an a la carte menu. For your best protection I highly recommend selecting the majority of the tests. Yes the house inspection will cost more, however, you could prevent yourself from spending thousands or tens of thousands of dollars down the road on resolving a major problem with your new home. For example, the installation of a new leach field could cost you $20,000 or more. Similarly, insect damage to the home’s sill plates could cost your $10,000 or more to repair. When the home inspector actually performs the inspection it is wise to follow him or her around and bring paper and pencil. This way you can keep your own notes based on what he or she finds. A thorough house inspection should include at a minimum a mechanical and structural inspection. From a mechanical perspective, the house inspection should include a thorough review of the electrical, heating, and plumbing systems. As part of the electrical phase of the inspection they should inspect the home for proper electrical wiring and the use of ground fault and arc fault circuit interrupters. In addition, light switches and fixtures, outlets, and bathroom exhaust fans should also be examined to make sure they are functioning properly. As part of the heating and air conditioning phase, the house inspector should check that the furnace and air conditioning systems are functional, have been properly maintained, and are free of rust and corrosion. In addition, they should be checked for proper sizing, relative to the heating/cooling area required in the home. When a room addition is added to a home, often the existing heating/cooling system is not replaced and thus is inadequate for heating/cooling the home properly. As part of the plumbing system inspection the house inspector should inspect every kitchen and bathroom plumbing fixture to make sure they work properly and that they do not leak. In addition, they should turn the valves on and flush toilets and evaluate the recovery time for the toilets and water storage tanks to fill. All plumbing valves should also be inspected for proper operation and corrosion issues. Also, any appliances being sold with the home should also be thoroughly reviewed by the home inspector. From a structural point of review the home inspector should examine the home from the foundation up to the top of the roof. As part of this inspection they should be checking sill plates, floor joists, attic space, and overall construction of the home. They should check to make sure proper sized lumber is used for the various areas of the home and that the lumber has not been damaged in anyway, due to a previous homeowner, insect infestation, or water damage. They should also inspect the roof to evaluate the integrity of it and the quality of the roof shingles. In addition, they should inspect around chimneys, and flashing between chimneys and wall surfaces. As part of their structural house inspection they should also inspect the home for water damage or water problems. In addition they should inspect all doors and windows to make sure they function properly and that there is no sign of rot, water, or insect damage associated with them. In addition to having the basic mechanical and structural house inspection, you should also elect to have the water tested and the home checked for radon problems, including radon in the water supply. Moreover the home should be checked for lead paint, asbestos, formaldehyde and other hazardous building materials that were once used in home construction. The house inspector should also inspect the exterior of the home, as well as the yard. If the home has an on-site septic system it should have its own separate inspection. The septic holding tank cover should be removed and the interior of it thoroughly examined. Also, the leach field should be evaluated to confirm that the ground surface is not wet and mushy. A separate insect house inspection should also be done. An insect home inspection is more comprehensive than a quick once over of the home’s foundation and framing. Most lending institutions require this as carpenter ant and termite damage can dramatically put the home’s structural integrity at risk. Finally, the house inspector should also check for mold problems within the home, including in the basement and attic spaces. Mold growth is a major health issue and both the lending institution and homeowners will want to make sure the home is free from it prior to purchasing the home. Within a few days of completing the house inspection the home inspector should provide you with a complete and thorough written report specifying the inspections that were performed and any issues that he or she uncovered. You can then address the specific issues with the seller to have them either fix them or reduce the sale price of the home to allow you to fix them at a later day. Also, you’ll most likely need to provide a copy of the house inspection report to the lending institution. To find a home inspector in your local area check the American Home inspector Directory, which maintains a national database of home inspectors. 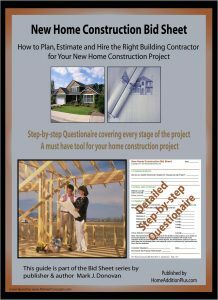 Similarly you can find a home inspector via Renovation Expert’s national database of contractors and home inspectors. Simply fill out their free form and 3 to 4 home inspectors in your local area will contact you. There is no charge or obligation to use this service or any one of the home inspectors.